Of all of the contrivances of humankind we've stumbled upon since the dawn of civilization, none is more inherently absurd than the prosaic "To Do List." Why? Because despite its obvious utility, there is no more quixotic endeavor we will ever embark upon in our lifetimes. That's because no one --- not Leonardo DaVinci, not Albert Einstein, not even James Franco --- has ever completed one. 1) Complete all work on Kropotkin File. 3) Write the great American novel, making sure to create iconic characters named Huck, Atticus, and Dr. Sidney Horowitz. 4) Deliver Ted Talk explicating Joycean imagery and Boolean logistics in both Ted movies, I and II. 5) Usher in era of world peace and understanding. Back when I was in school we were taught that when a task was finished you should make a cute little check mark and place it delicately to the right side of the task indicating its completion, then go off to have tea and dainty sandwiches with the duchess. That is not, however, what I do today. What I do is I grind my pencil on the completed task back and forth and back and forth with a furious vengeance until the item is totally obliterated and forever out of my life. When I am done with all tasks on the page, it looks like a piece of blackened redfish. 6) Report status of Kropotkin file to Kropotkin. 7) Terminate under-performing employee, making sure not to dance happy jig during termination meeting. 8) Discuss diction discrepancies discretely with Dickson. Say that fast five times. 9) Attend fiscal budgeting meeting with Finance, drinking gallon of Red Bull first. 10) Double Down on something. Why do so many of us put so many tasks on our To Do List knowing full well we could never hope to complete them all? Chalk it up as a triumph of hope over experience. Even though yesterday’s list is as barren of check marks as a Hollywood Squares game board played by contestants totally baffled by Paul Lynde and Charley Weaver, we all have a need to believe about ourselves that tomorrow we’ll be sharper, quicker, and less hung over than ever before, and dad gum!, for the first time ever we’ll get everything on the list done! 11) Arrange weekend staring contest. 12) Fantasize about being friends with Samuel L. Jackson. 13) Collect all loose paper clips. I don’t know about you, but comes the end of the day and what have I accomplished from my list? Well, I’ve got all those paperclips in outstanding order and believe me, Samuel L. Jackson is great to play golf with but you got to watch him carefully around the greens. And this, I’m afraid, will ever be the state of humankind unless and until someday somewhere someone comes up with perhaps the most important invention humankind could ever hope to devise. 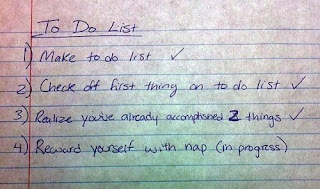 The Self-Completing To Do List. Until then, we are all hopelessly Prisoners of Agenda. I can't believe you didn't include "Watch Paint Dry" somewhere on your list, but since that's probably a daily occurrence there's really no reason to write it down other than to see that glorious checkmark beside the line. Personally, I'm more into a To Don't Lists. 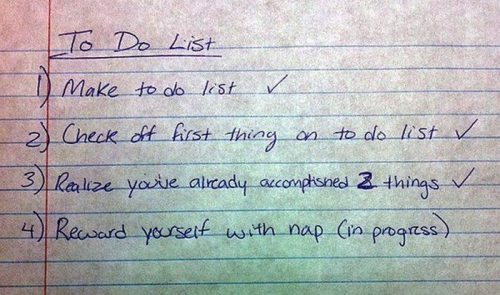 The great thing about this list is you never have waste time checking things off and you still get that wonderful feeling of non-accomplishment from never having started any of the tasks that you didn't want to do anyway. I keep an active To Don't List too. It's amazing how often sexual relations with women the world wide is on it, and you're right - I get tremendous satisfaction from not ever getting a single item done!